Note: To change the background image of the Front Page 1 widget area, navigate to Appearance → Customize → Header Media and upload an image or YouTube URL. The theme demo has one Custom HTML widget and 3 x Genesis Featured Page widgets in this widget area. Each featured page has the same settings with a different page. The Front Page 4 widget area uses an Image widget to add a background image to the section. The Image widget must be the first widget in this section. It then has a Custom HTML widget that contains the video 'play' button as well as some text. It also has a Video widget that is hidden by default and displayed in a lightbox popup when the video play button is clicked. The video play button must contain the show-video class, as seen in the code snippet below. It is recommended to use a YouTube URL with the 'Insert from URL' option instead of uploading your own video. 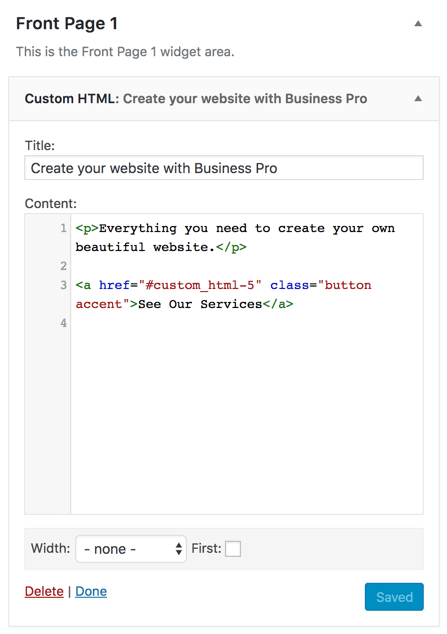 In older versions of Business Pro, the Front Page 5 widget area contained 2 Custom HTML widgets, one with a title and intro paragraph and one with a Display Posts Shortcode. Please note that the Portfolio Items in the shortcode will only be displayed if they have a featured image set. 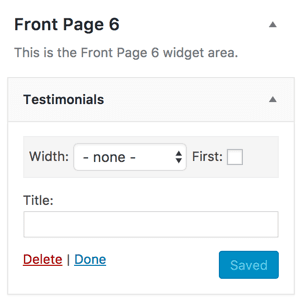 This widget area contains one Testimonials widget with no widget title and no column class.